Some super strong and awesome CF Jenks athletes in that pic. Looking good and almost in unison! That workout destroyed me. It hurt me good. Do not know why it was so hard on me. I had no business doing 185lbs, but it sure did not feel like it was the weight that smoked me so bad. 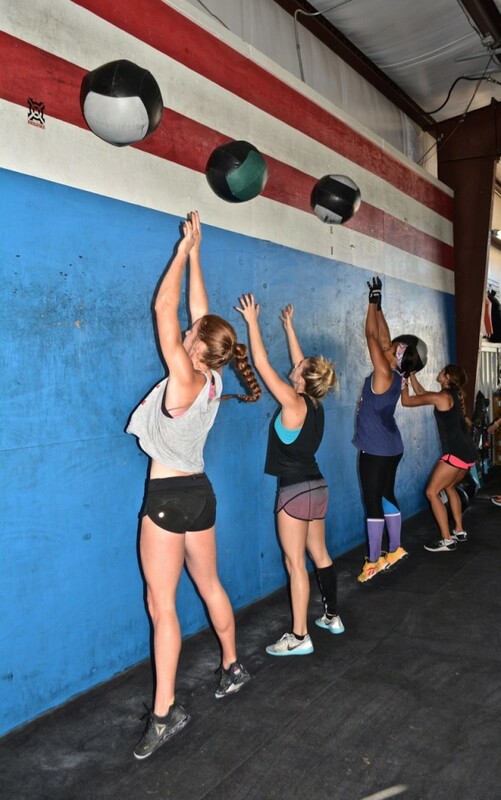 My hat goes off to any Master’s that was able to finish this WOD at the CF Games in the time cap with a fat bar. Just for fun I looked at my master’s class and the Stud (Ron Matthews) who won did it in 5:20, 2nd at 6:49 and 3rd at 7:53. Wow! 3-2-1 Complex = 125 – 155 – 185 – 205 – No more, 205 was it as I want to jerk with my left knee. WOD “The Final” = RXd = 8:31 – Should have scaled to MRX at 135 or 155lbs – stared at bar too much, still not sure if it was weight or my mental weakness or physical weakness, it just hurt. Wasn’t sure what French press was. forearms were burnin’ 🙂 Great job noon class! Thanks for the push, Georgie, and congrats on your PR!!! I did a bar muscle up for the first time today. Great job Georgie and Allie! Great push Allie, that was tough in the heat! Beautiful and strong ladies in this pic!!! C2b were 2:18- could not get a rhythm tonight. thanks for talking me into 125# Nicole! And Natalie, thanks for cheering me on. That was tough.